The village of Thale in central Germany was once a center for pagan worship. Nowadays it attracts large numbers of tourists who visit primarily for its hiking trails, notably the Harzer Hexenstieg (witches' way), a spectacular ninety-seven kilometre path through the mountains. Those of a less energetic disposition will also enjoy a museum of the German Democratic Republic, a thermal pool, a ropes course, and Erlbeniswelt Seilbahnen Thale, an amusement park with three roller coasters and two cable car systems leading to the Harz mountains, one heading west to Roßtrappe, the other heading south to Hexentanzplatz. An alpine coaster can be found at the latter, making it an obvious choice for enthusiasts. There is a limited amount of on-street parking available, though nothing on the roadway to the park and in any case finding a spot can be tricky. Those attempting to retrace our steps would probably be best off using the large free area at ground level (51.746°, 11.027°) located around ten minutes walk from the rides. It is also possible to park at the mountain top (51.732°, 11.027°) for a small fee, though the road to get up there is windy and steep, making the ground level a far better option. The amusement rides are divided into two broad sections. The first, located on the right as one approaches, contains a small selection of Heege products. 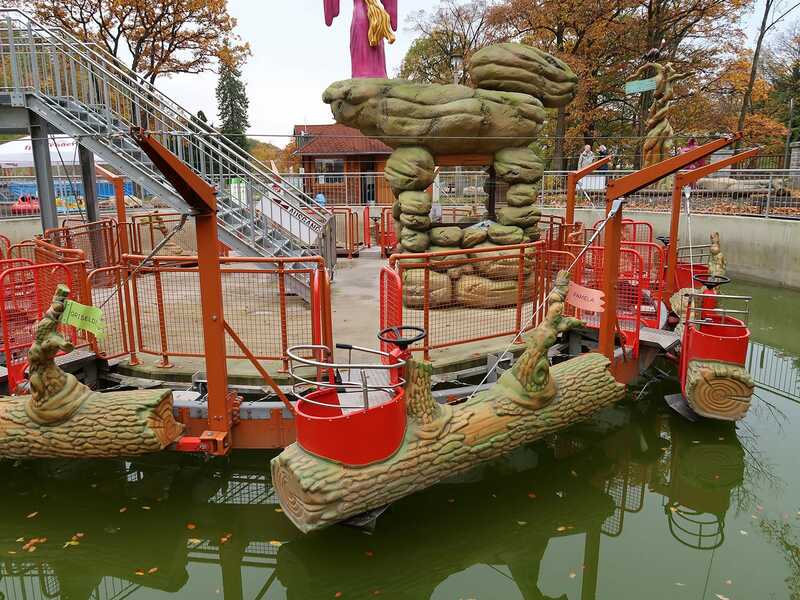 The remainder can be found in a larger area on the left hand side, including Spritzige Sause, a set of Zierer Jet Skis that is the only attraction to require an operator. Everything else can be started by scanning a rechargeable smart card on the appropriate reader. We walked around the grounds briefly to figure out how many points we'd need, and concluded that a €10 card would be sufficient to cover everything on our hit list twice. We decided to begin our visit with Boderitt (#2305), a suspended swinging coaster that premiered in 2015. The ride is the fourth installation of the Wie-Hex, an unusual hardware platform that in its most common incarnation features two seat cars that can swing from side to side. Six years ago I described an earlier version of the same product as stretching the definition of a coaster while meeting all my rules, and I've got to say that that language applies in equal measure to this machine, which shoehorns four lift hills into just over three hundred metres of track. We climbed into the lead car and lowered the communal lap bar which locked into place with a satisfying click. Megan scanned the card on the nearby reader, an action acknowledged with a gentle beep followed by an abrupt jerk as we were winched out of the station and up the first hill. The coasting section was faster than the lift, but only marginally so, as the track followed a gentle angled descent with no actual drops. The cars swung out a little on each corner, though not enough to frighten anyone but the most timid of riders. It felt like the subsequent lifts had been tuned to match the speed of the approaching cars, to the point that the whole experience felt little different to driving on a winding road with cruise control on. Our next stop was the prototype for the Wie-Hex family. Hexenbesen (#2306) is a flying coaster that is officially only open to those of sixty-five kilogrammes or less, though this rule has been widely ignored by enthusiasts over the years as can be seen from checking the ride page on Coaster-Count. Would-be passengers climb up a short flight of stairs and crawl into a clear fiberglass tube with a thick red mat at its base and no restraints whatsoever; instead, they are trusted to hold on to a thick set of bars at the front. Dispatch is enabled using the standard smart card, though in this case there is a separate button that has to be pressed in order for the vehicle to start moving. The ride itself is not aggressive in any way, and consists of a right turn, two left turns, a brief ascent, and a right turn to the brake. For all that, however, the completely horizontal riding position makes for an intriguing novelty, and the tracking is almost completely smooth, in sharp contrast to other rides where passengers lie flat. The car comes to a stop at an angle on the main lift hill, allowing easy disembarkation by sliding out backwards. A sensor on the exit turnstile records when a passenger is clear, at which point the lift motor engages to bring the car back to the boarding platform. We decided to leave the third coaster unti last, and instead bought combination tickets for the round trip cable car to Hexentanzplatz and the alpine coaster, which came in at €8 apiece. The journey to the top would have been nicer in better weather, but despite that the view was spectacular, augmented considerably by the many different colours of autumn leaves. We discovered too late that we'd missed out on the opportunity of a glass-floored car, but resolved to get in one of those (painted bright green) for the return journey. There was a signpost to Harzbob at the peak, and we dutifully followed it. The walk took about ten minutes, around two thirds of it along an upward sloping forest trail. The final portion was somewhat less scenic, as we passed down the side of a giant car park, but on the far side the trees had just closed back in when the boarding platform came into view. There were other guests milling around, but nobody was actually waiting to board, and thus we took our seats directly. The acceleration levers on my car were unusually stiff, but I figured out that I had enough flexibility to rest my feet on them, allowing me to travel at full speed without undue effort. The track layout was a huge improvement over yesterday's installations, and I really enjoyed my ride. Half an hour later we'd returned to ground level where we unaccountably found nobody queuing for the only mark one Butterfly (#2307) to feature a themed car, in this case the standard yellow bucket augmented with a cat's head on one side and a tail on the other. There was a distinctive squeak each time the car passed through the station, and while this was almost certainly unintentional I nevertheless decided to think of it as a non-existent mouse for the animal to chase. 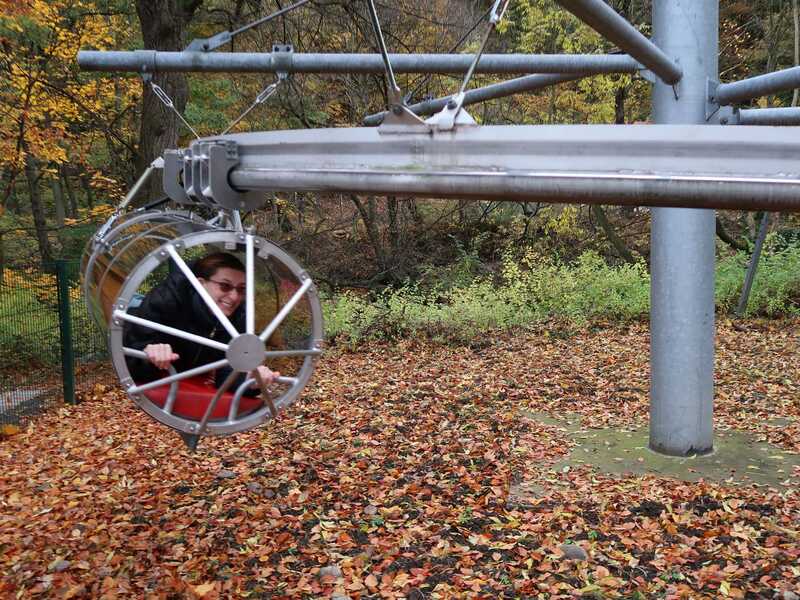 Our final stop of the day was at an alpine coaster located in Bad Saarow, just east of Berlin. The location wasn't signposted, and anyone with a healthy distrust of their GPS could easily be tempted to abort the journey after being instructed to follow a narrow road that appeared to lead only to a museum. We kept the faith, however, and out of nowhere a permanently mounted Wiegand sled appeared in front of an unprepossessing building. 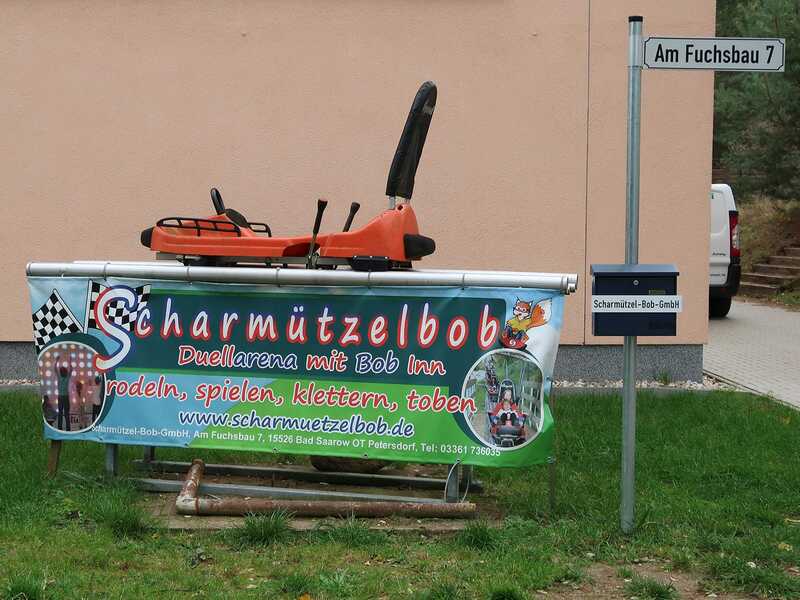 My first impression of Scharmützelbob was of a fairly undistinguished ride, but there was something strange about the layout that I couldn't quite put my finger on. Within seconds of leaving the lift hill I saw a second person cresting, and no sensible operator would allow two cars to be that close. It was only when I reached the braking area that the truth became clear; the ride actually had two separate lifts, and each was followed by a lengthy momentum-powered descent. The result felt like two rides for the price of one, and the €3 price tag made the whole experience excellent value for money.